After 16 months in the game, I feel safe calling myself an expert in glass baby bottles. I knew right from the start that I wanted to go glass with Will's bottles to avoid unsavory leaching into his earliest meals. There are a few more glass bottles on the market now than when we started this journey (ones I'll have to try out next time around!) but here's my rundown on the three that we tried. 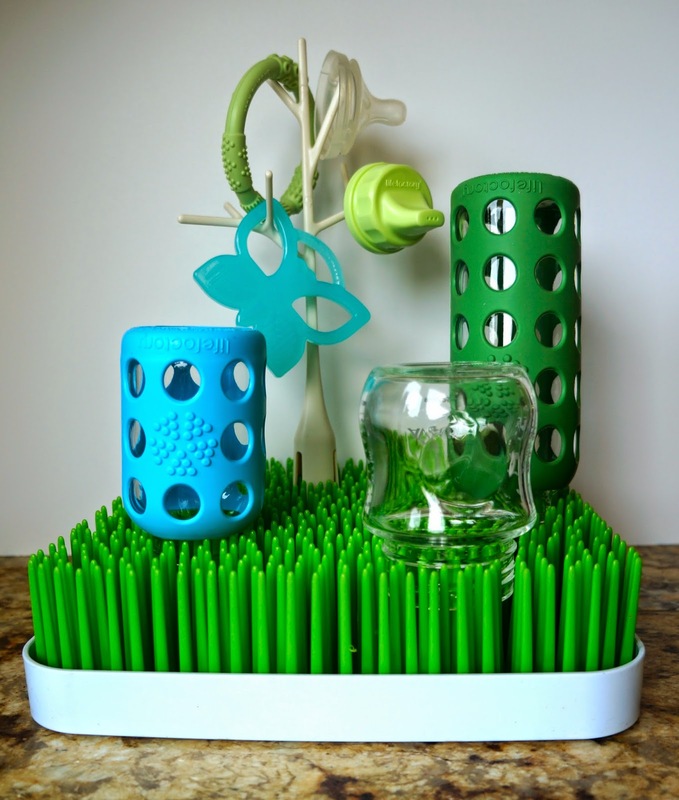 First up are Lifefactory bottles, which come with silicone sleeves in fun colors. At $14.99 for the smaller bottles, they're definitely in the "spendy" camp but I knew they'd be sturdy from dropping my adult-sized Lifefactory water bottle on concrete more than once. I like the way they look (we've received many compliments on them) but I really like how they've stood up to tons of use. First they withstood sleepy, clumsy new parents who were perpetually knocking things over and they are still in use with a toddler who likes throwing everything. Speaking of "still in use", you can see in the photo below that Lifefactory sells tops to turn their bottles into sippy cups once the traditional bottle days are over. These still get heavy daily use and will still be in good shape when we have another baby down the road. So although these next bottles don't turn into sippy cups like the Lifefactory ones, these were actually my favorite during the bottle stage of Will's life. The Phillips AVENT glass bottles have a wide neck which made them super easy to clean and super easy to pour pumped milk into without splashing/wasting any. These two reasons alone are enough to earn a new mom's love, but I should mention that they were also super sturdy, even without a sleeve (though I see that you can buy those online). Will has tossed these onto the sidewalk from his stroller before and though I gasped and expected breakage while it happened, they were fine. They were also wider than the other bottles and easy for Will's little hands to grip once he began feeding himself. Once you figure out how to get the top on (it needs to be done just so), these are a solid glass bottle choice and one I'd definitely recommend. The third type of glass bottles we used were Dr. Brown's. I know other people love these (4.5 stars on Amazon), but I didn't like them at all. All of the hardware that comes with the bottles (see below) is supposed to help with gas and spit-up. We didn't notice any remarkable difference (though to be fair, Will wasn't very fussy to begin with) and I hated cleaning all of the parts. My biggest problem with them, however, was that the neck of two out of four bottles chipped. Pretty much the biggest problem you can have with a glass baby bottle. I know that Will didn't get any glass, but I was mad that I had to throw away two full bottles of pumped milk and 50% faulty bottles were enough to have them taken out of our rotation (I carefully used the remaining non-chipped ones for milk storage). Any experience with glass bottles? Anything I missed? This is what worked (& didn't work) for us over the last year but I'd love to hear other suggestions! Chicago is the best city in the world. There is always something awesome going on - especially as it relates to food. Summer is a BLAST in Chicago - and it makes me cringe to think we're already deep into July. But WHATEVER. 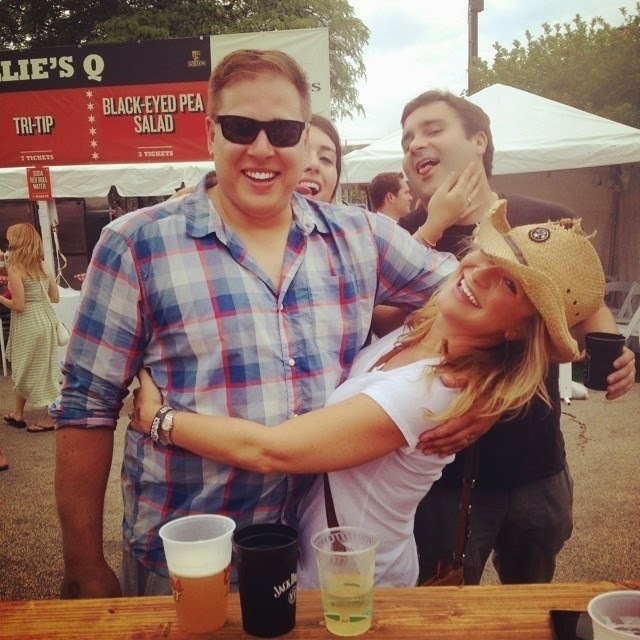 At least I'll have these pics from Chicago's Windy City Smokeout to get me through the subzero temps of winter. So you guys ever watch BBQ Pit Masters? If so, you know exactly who the below BBQ legend is. Mr Myron Mixon ladies and gentlemen. 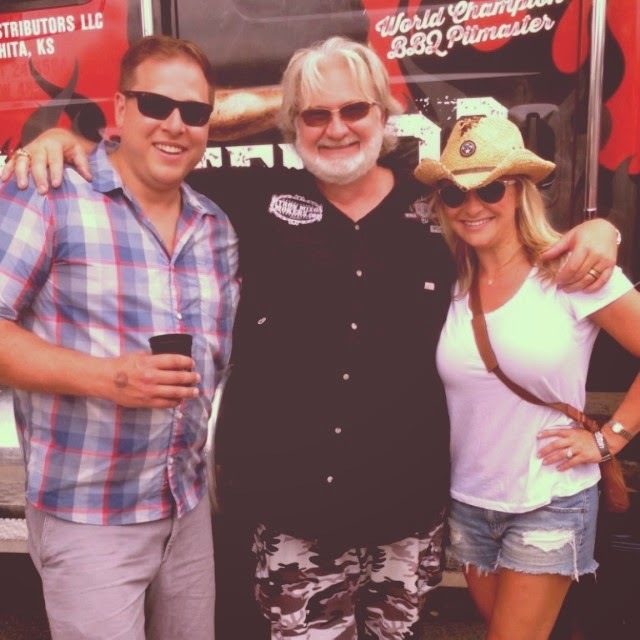 We knew his BBQ was going to be at the Windy City Smokeout but not him! We were very excited to "meat" him and is legendary food. Sorry. Bad joke. He was so nice and lovely and was bee bopping all over the festival. What a guy. Here is his super famous, unbelievable whole hog. 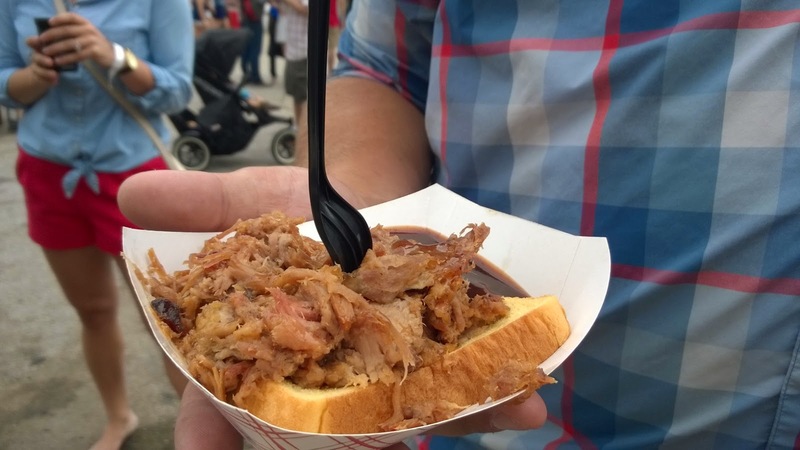 It was the texture of pulled pork but like 500 times more flavorful. HOLY COW PIG this was delicious (sorry Caitlin). 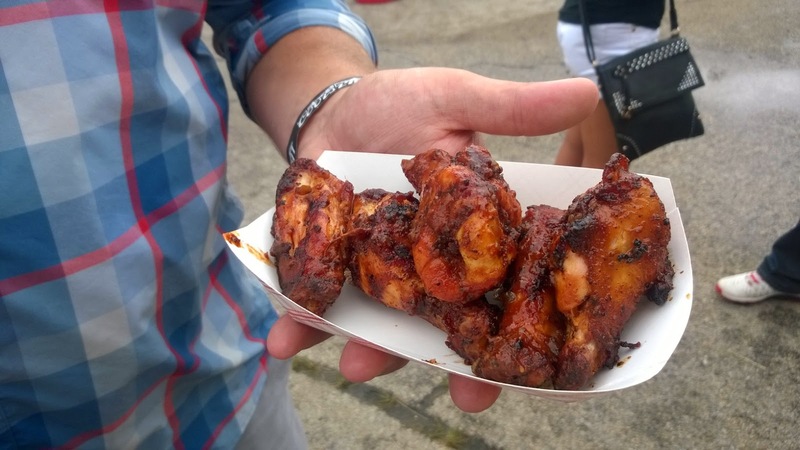 We also had smoked wings. I can't remember if we got these from the Dinosaur BBQ stand or from Myron (food blogger fail). But these were ridic. I have no idea where these came from or who bought these because it was late in the day and I was on my 15th Jack Daniels and tea, but they were OUTSTANDING. 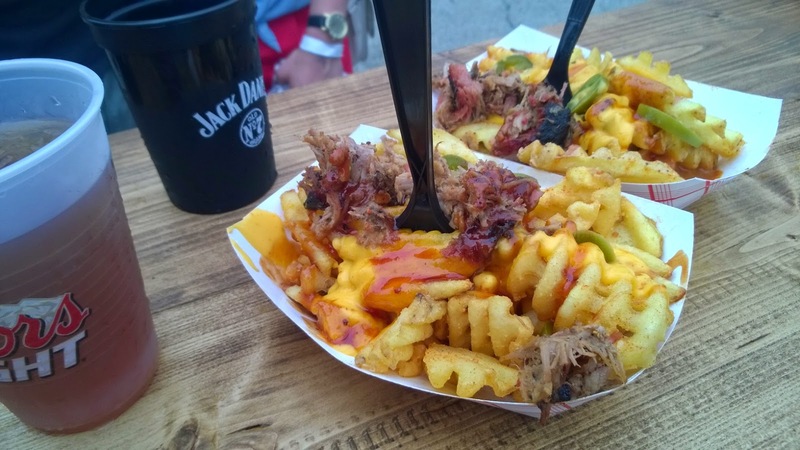 Waffle fries topped with pulled pork, pickled jalapenos, cheddar cheese sauce, and BBQ sauce. I'm still working these bad boys off. 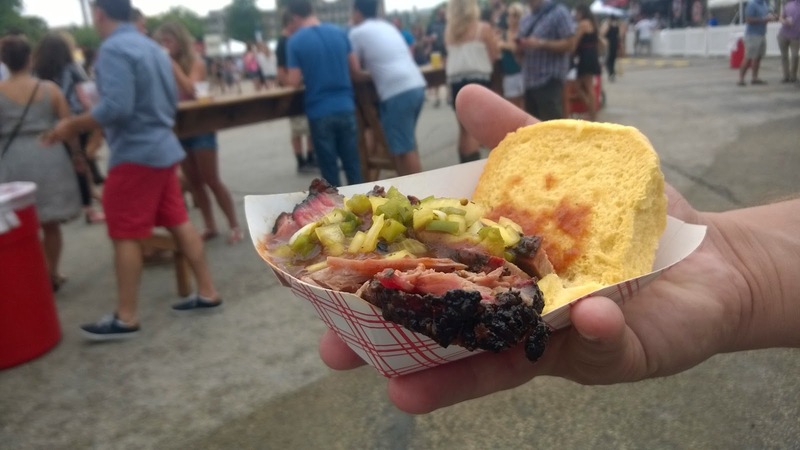 This was the best brisket we had all day. 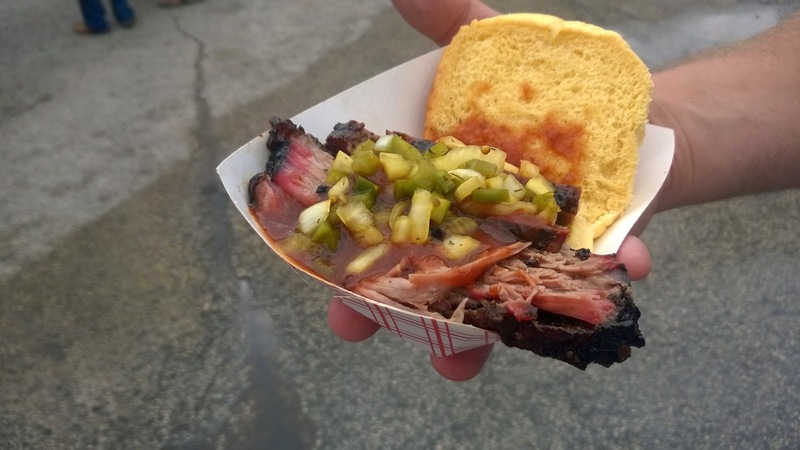 It was from Dinosaur BBQ and was topped with BBQ sauce and pickled onions and jalapenos. Check out the smoke ring and the bark. It basically melted in our mouths. YUM. Pic of said brisket bark. I would seriously give anything to have a bite of that right now. 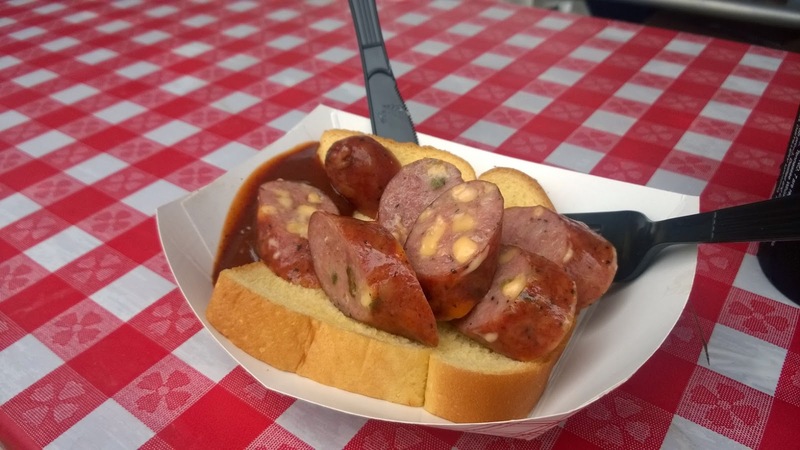 This was legit - jalapeno cheddar smoked sausage from Smoque BBQ. I mean. WHAT. Ribs. Obvi there would be ribs. There were from Pappy's. They were amazing. 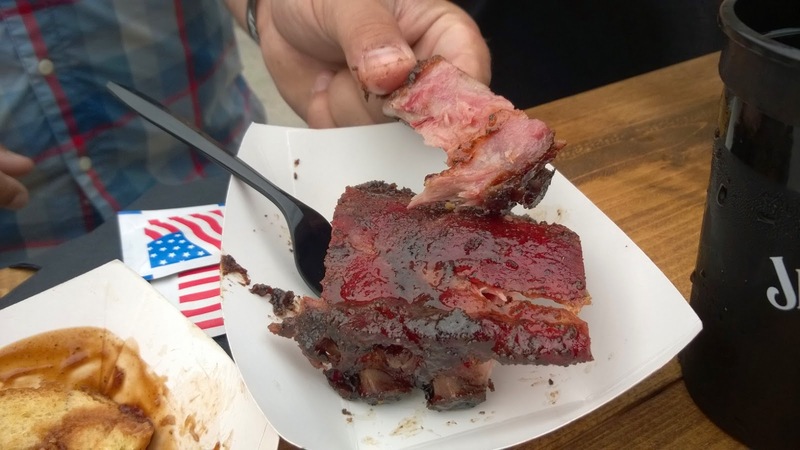 Fall of the bone tender with a TON of seasoning that formed this chewy flavorful crunch. Hello. This was my favorite. I went back for seconds. And then I went back for seconds again. Thirds? Fourths? I lost count. This was the smoked sausage from Salt Lick...and their BBQ sauce which could seriously make you cry. 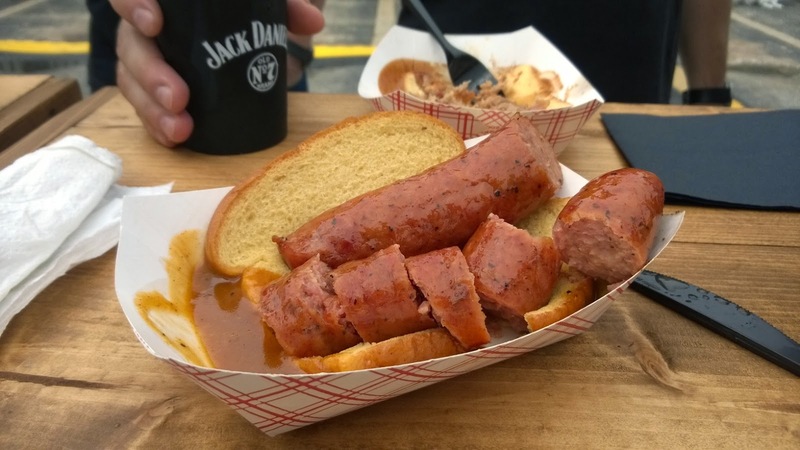 I did a big no no and would bring meat from other stands and slather it with Salt Lick's sauce. I think they were slightly annoyed but who can blame me? This is our kind of happiness. Food. Sun. Whiskey. Beer. And friends. Very good friends. 1) I've started watching The Bachelorette. How I made it all the way through my twenties without watching any of the series is beyond me. I started watching because Howard Stern wouldn't stop talking about it and my only regret is not starting sooner. 2) My garden is growing like crazy. Our herb garden always does pretty well (installed this summer with the same setup as usual) but our veggie garden is doing well this year, too. Peppers, eggplant, zucchini, cucumbers, and tomatoes galore. 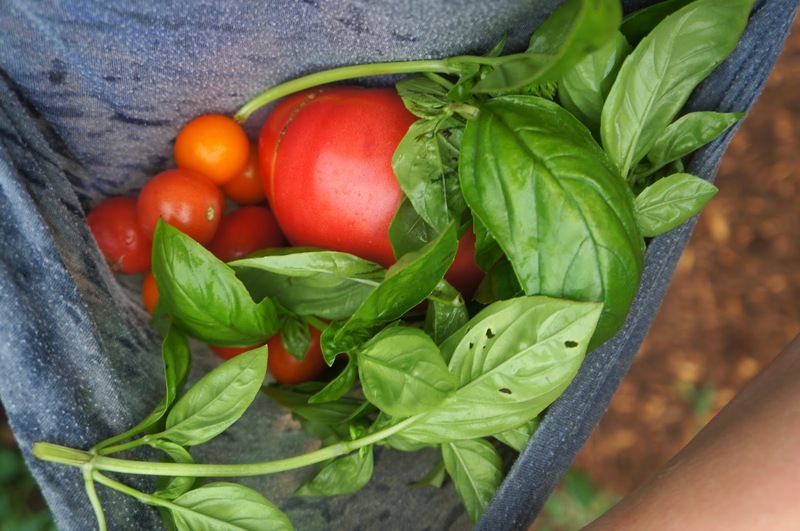 We're getting to the point in the summer where we're about to be overwhelmed with delicious, fresh produce. 3) After years of regular-dress territory, I've decided that I can maybe pull off a maxi dress. Perfect for looking fancy when I'm really not and for sitting on the ground when playing with Will. 4) ...and speaking of Will the Baby, we have a walker! For the last few months he has been getting steadier and steadier on his feet and I feel like I spend most of every day chasing him around the house. 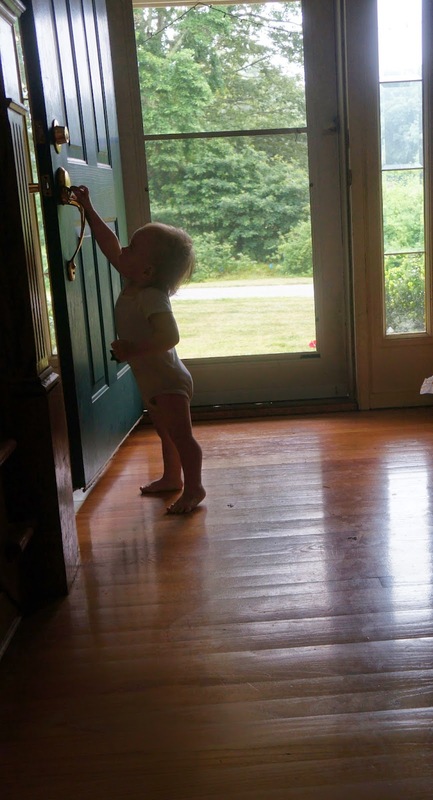 He's an expert at de-childproofing (maybe we're just awful at childproofing?) and that's really what's been keeping me busy. The picture above reminds me that I've wanted to paint our front door a bright, punchy color (and have for a while). It also makes me realize that I probably won't be doing it for a while. Naptimes, when most bloggers seem to complete their projects, are usually spent trying to control house chaos or take a nap myself. How long does the "sleep while the baby sleeps" rule apply? 4th grade? College acceptance? ...and the promise to be back soon with some more posts and photos! Thanks for hanging in there (stay hungry! stay homey!). Jalapeno poppers are one of my moms favorites. And one of my favorites. And one of Charlie's favorites. And well, every one's' favorites. I was in charge of dips this 4th of July so I decided to turn this oh so popular appetizer into a dip-able masterpiece. AND OH WAS IT. I mean, my taste buds were doing straight up karate chops. Very rarely do I make something that I can't stop eating. I usually enjoy what I make - but I think that's just a cooks curse - you're always critiquing your own recipes and wondering how you can make it better next time. NOT THIS...OMG not this. It was so freaking delicious. I think I ate half the pan. I just hung around it like a little hover craft, not so discretely licking my fingers and anything else that accidentally (ahem) ran into the dip. Perfect combo of spicy, bacony, cheesy, creamy, crunchy, and soul satisfy...y. I'm sorry you're reading this. I sort of wung the recipe. I was talking to my mom and tasting as I went along, but I pretty much remember the recipe. I started with crisping up 12 pieces of microwave ready bacon (genius for dips when you don't want to fuss with bacon grease), placed the warm bacon on the cream cheese to soften it up, and then added chopped green onions and jalapeno peppers. I then added some mayonnaise (don't you dare use miracle whip or I'll hunt you down) and some sour cream. I then added some garlic powder and then some colby jack cheese. Because you obviously need cheese. ...and after baking in a 400 degree oven for about 20=30 minutes, I got THIS. Creamy crunchy GOODNESSSSS. MMM. MMM MMM MMM. Say what now? MMMMMMMMM. Leave cream cheese out until it reaches room temp to soften up. Crisp up microwave ready bacon and crumble. While still warm, add to top of cream cheese. Add jalapenos, green onions, garlic powder, mayo, sour cream and colby jack cheese. Taste and adjust as needed.Mix and spread into baking dish. Melt the butter and add the panko breadcrumbs and then sprinkle on top. Let dip chill in the fridge for at least 4 hours, but can chill for up to 2 days. Bake at 400 degree oven for 20-30 minutes or until breadcrumbs are a rich golden brown. If needed, you can turn your broiler on at the end if they need an extra toasting. Serve with crackers, thinly sliced toasted baguette, carrots, frisbees, or shovels.